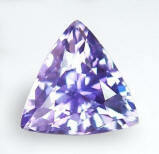 Gorgeously shaped, alluring, unheated, Ceylon blue "cornflower", color change to platinum-pink sapphire. A magical trillion! Delicate in color, amiable in spirit, unheated, Ceylon light pink sapphire. Very well cut. A delightful, unheated, Ceylon pink sapphire, weighting 1.02 cts., pastel, "baby" pink color, excellent, "antique" cushion, "flower' cut, measuring 5.95x5.04x3.70mm, eye flawless, VVS1 from the gem fields of Pelmadulla, Sri Lanka. Browsing a wild company also selling colored stones, we are blown away by the absurdly high, well, astronomical prices. I am wondering if those people are really purchasing at those crazy prices. In all, I am asking myself if the world has gone completely out of tune or what.....Here, you find gorgeous material at great prices. Customer service might not be our best asset, but our sapphires certainly are. 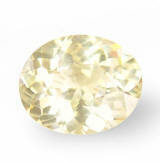 Bright & unique, perfect cut, unheated, Ceylon "champagne sapphire. Great buy. Beautifully shimmering this unheated, Ceylon "fancy" sapphire weights 1.13 cts., pastel, light tone, "yellow-champagne" color, masterly executed for large appearance (and yet no window), oval, "flower' cut, and measuring 7.32x5.98x3.36mm, flawless gem, IF-VVS1 from the gem fields of Elahera, Sri Lanka. Ton of scintillation, this sapphire faces up like a 1.7-1.9 cts. sapphire. Super clean as well...Everyone should be incentivized to purchase all completely natural, unheated, Ceylon "fancy" sapphires at these dealer prices. The best value anywhere. Start your collection today. And remember, the more you buy the more you save. Sweetly romantic, delicately flawless, very rare, unheated, Ceylon "Padparadscha" sapphire. More than a deal. Most of the time, I get amazed about our prices... An incredibly lovely & immensely shimmering, unheated, "Padparadscha sapphire this one, weighting 1.42 cts., pastel, orangish-pink color, magnificently executed, oval, mixed cut, which measures 7.05x5.44x4.45mm, eye flawless (extremely clean! ), VVS type2 from the gem fields of Nivitigala, Sri Lanka. Delicately beautiful, shimmering and very rare (unheated Padparadscha). Other companies sells 5 times or more something similar, so unless you like to overpay thinking that paying more assure you more quality, this gem is a gift for the savvy in you. 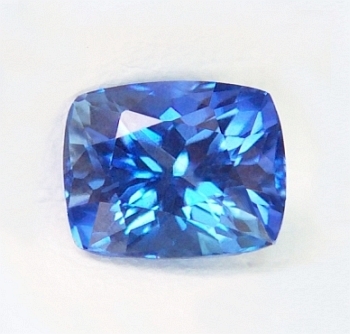 Gorgeously charming, well cut, unheated, "peacock blue" color, Ceylon blue sapphire. Beautiful gem...awesome color. What a beautiful a color...and at such a low price! This unheated, Ceylon sapphire weights 1.10 cts., fine, medium-dark "peacock" blue color, excellent, rectangular, cushion, mixed cut (with "flower" pavilion), measures 5.8x4.93x4.2mm, eye clean, VS1 type2 from the gem fields of Elahera, Sri Lanka. We deal exclusively in unheated, Ceylon sapphires. Not only unheated, but possessing finest cutting, superb luster and eye clean clarity. And we are confident that our prices are unmatched in the industry for the quality offered. Overall, a great, unheated, Ceylon blue sapphire with excellent color and fine cut for very little money! 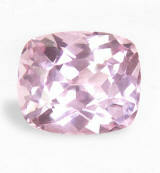 Spell-binding with zesty luster, light pink, unheated, Ceylon sapphire. Gorgeously cut, sparkling...awesome. Charming, unheated, Ceylon "fancy" sapphire weighting 1.04 cts., light pink with lavender undertones (shifting to baby pink color in incandescent light), excellent, rectangular, "antique" cushion, mixed cut, (with flower pavilion), measures 6x5.2x3.73mm, eye flawless, VVS type2 from the gem fields of Nivitigala. A blinding light pink sapphire with perfect light return. The cut is simply outstanding, and the clarity is basically loupe clean. You should not think too much at this price...worth much more. Perfection in Padparadscha. Perfect color, cut & clarity. Rarer than a diamond, the most sought after of all sapphires. A gorgeous one. A most awesome, 100% no heat, Ceylon Padparadscha sapphire, weighting 1.26 cts., medium, intense, pink-orange color, masterly executed, oval "flower" cut (known also as "Portuguese" cut), and measuring 6.50x5.93x4.93mm, eye flawless, VVS2 from the gem fields of Nivitigala, Sri Lanka. The nicest Ceylon pink-orange, Padparadscha sapphire from our last trip to the fabled island-nation of Sri Lanka in November 2012. 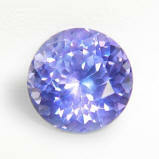 Availability for any color sapphire in any size, that is left completely natural & untreated is basically nil. Very little is found in the clay ground of Sri Lanka. Prices are at an all time high. This therefore, it is a steal. 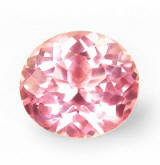 A feast to the eye, super lustrous, awesome color, unheated, Ceylon "bubble gum" pink sapphire. Gorgeous. HOT sapphire! 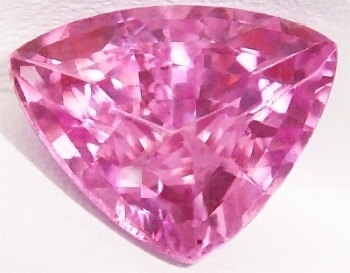 Weighting 2.02 ct., medium, pure, "bubble gum" pink, excellent, trillion, mixed cut, measuring 6.7x8.59x4.96mm, eye flawless, VS type2 from Ceylon. To us, this is unheated, as under microscopic examination intact crystals are spotted. 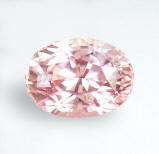 Extremely lustrous with a hot pure pink color, this is a great stone and a true steal. Check out prices around for this quality and you will agree with us. Hot pink sapphires in 2+ ct. sizes are very much in demand and command huge prices. Do not hesitate on this one! A total giveaway!! 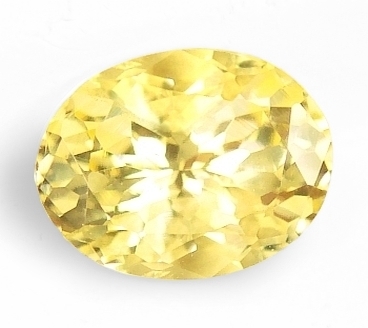 Scintillating, very well cut, like a drop of sunshine, unheated, Ceylon yellow sapphire. With prices skyrocketing for unheated yellows, this yellow sapphire from Ceylon is a great find. It weights 1.06 cts., medium, vivid, "lemon" yellow color, perfectly executed, oval "flower" cut, and measuring 6.77x5.49x3.72mm, eye flawless, IF-VVS1 from the gem fields of Marapana, Sri Lanka. 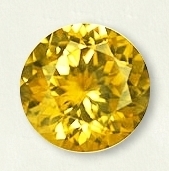 Sri Lanka yellow shades in sapphires are considered the purest and prettiest among yellow colored stones and among other yellow shades in sapphires form other locations. Truly vibrant & pure, this sapphire simply possesses a remarkable scintillation and lovely eye appeal. Consider a bringer of wealth in Eastern philosophies. Absolutely gorgeous, truly lustrous, rare, unheated, Montana bi-color blue-yellow sapphire. A must for any serious collector. What a beauty! From an historical, all US location, this unheated "fancy' sapphire weights 1.04 cts., medium pastel, blue & yellow bi-color, masterly executed, round, "flower' cut (known also as Portuguese cut), it measures 5.8mm in diameter by 3.9mm deep, eye flawless, IF-VVS1 from from the Eldorado Bar, Missouri river, near Helena, Montana. Both colors blend perfectly in a greenish-teal color, yet they are distinguishable and maintain their own hue. The cut is perfect and the luster is simply exotic. A very well price, super rare, unheated Montana bi-color sapphire that will mount exquisitely in any setting. 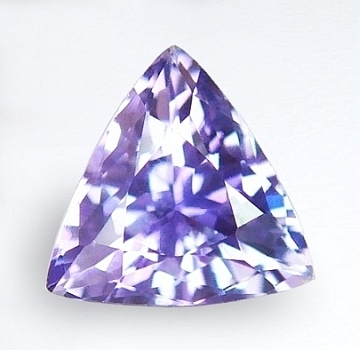 Spell-binding, awesomely cut, color change, violet to pink-purplish, unheated, Ceylon sapphire. One-of-a-kind. Sparking, sparkling, sparkling! This Ceylon, color change, "fancy" sapphire weights 1.20 cts., pastel, violet color in daylight, changing to pink-purplish in incandescent light, masterly craft in a trillion, mixed cut, and measuring 6.9x6.85x4.08mm, eye flawless, VVS type2 from the gem fields of Nivitigala, Sri Lanka. This will mount a standard, calibrated setting 7x7, so either pendants or rings, we have many settings available. Unheated and untreated as mother nature created it, scintillating and emanating a superior eye appeal. Excellent price for this well cut, unique color change, unheated sapphire! Unique & rare color, scintillating, unheated, "fancy" Tunduru sapphire. Nice...and very inexpensive. 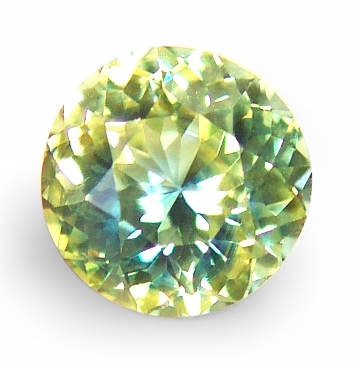 Here is an unheated, "fancy" sapphire weighting 1.02 cts., medium, very saturated, yellowish-greenish color, perfectly executed, round, "flower" cut, measures 6.4mm in diameter by 3.37mm deep, eye flawless, VS type2 from the Tunduru region, Tanzania, East Africa. This region, located in the Southern part of Tanzania, together with the Songea area, have been producing unheated "fancy" in all colors, for the past 25 years. The majority of the stones mined are blue-green to green to yellow-green in colors, but occasionally fine blues, true golden, brownish-padparadschas and even rubies are found. This one has a very unique charm. Definitely for the collector. Peacefully delightful, very rare, unheated, Ceylon violetish-blue, color change, "fancy" sapphire. Enchanting gem. 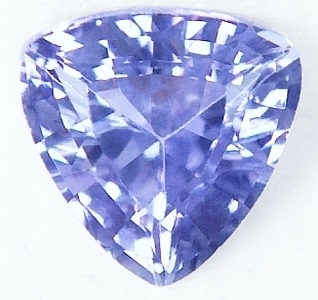 Such a lovely and delightful, unheated, Ceylon "fancy" sapphire weighting 1.46 cts., medium, intense, violetish-blue color (with excellent saturation) in daylight, changing to pink-violet in incandescent light, perfectly executed, round, flower cut, measuring 6.8mm in diameter x4.47mm deep, eye flawless, VVS type2 from the gem fields of Marapana, Sri Lanka. Truly a rare color, as a pure, saturated violet color is not often found in the gem gravel of Sri Lanka. Needless to say, this is a peaceful and delightful unheated sapphire that will mount a 6.5 or 7mm round, calibrated setting...and will charm you forever....at a very low price. 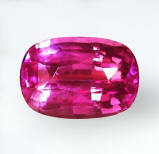 Captivatingly rare, unheated PGS certified, intense "rose-orchid" color, Ceylon sapphire. Something beautiful. A very rare and expensive color for an unheated, Ceylon sapphire, weighting 1.65 cts, medium, intense, purplish-pink color("orchid color"), excellent , rounded, cushion, mixed cut, measures 7.9x7.35x3.53 mm,eye flawless, top VVS type2 from the gem fields of Ratnapura,Sri Lanka. The spread (face) is great, and the stone looks like a 2.5 cts. sapphire. Superb eye appeal and... no enhancement! If you want something rare, uniquely beautiful, then this is the color for you! $250 value, US cert from Professional Gem Science laboratory free of charge with purchase. Well below wholesale...very rare. Alluring, hot pink, Ceylon, low heat sapphire. Gorgeous shape...top gem, hard-to-get. 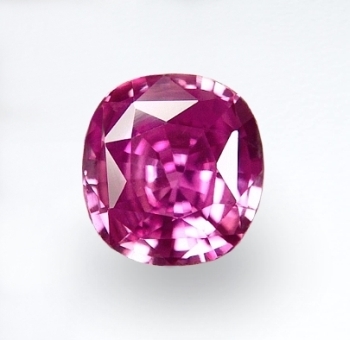 A top hot, hot, Ceylon pink sapphire, approaching a ruby color. A mesmerizing Ceylon sapphire with an amazing beautiful cushion shape. It weights 2.22 ct., top hot, hot pink color, with slightly purplish undertones, masterly executed, cushion with rounded corners, mixed cut, measuring 9x6.2x4.18mm, eye flawless, VVS to VS type2 from Sri Lanka. A very scarce supply of red-pink sapphires, in the past year, has caused to skyrocket prices and limit availability. Pink sapphires have reached exorbitant prices. Here is your chance to get an amazing pink, perfectly cut, & clean at a great price! AWESOME GEM! Beautiful & unusual, rare, unheated, Ceylon "mint" green zircon. 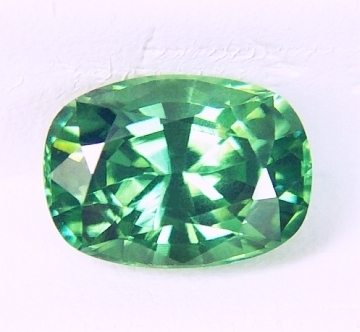 An unique green gem. A rare, natural, unheated green zircon, weighting 2.36 ct., excellent, rectangular cushion, mixed cut, measuring 8.3x6.2x5.05mm, flawless gem, VVS type1 from Sri Lanka. A real beauty, perfectly flawless, top cutting and with an excellent "mint" green color, not too dark, not too light,... just a perfect green. Furthermore, a good size for that special ring. 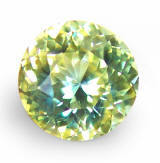 Unheated green zircon of good color like in this case, is considered very rare and command huge prices among connoisseurs! This one is very well priced and definitely beautiful and worth every single penny of it!